As furry animals go, skunks are rather cute and can even become valued pets when domesticated and desacked. Unfortunately, they evolved a peculiar defense system – spraying odious odor, which is a concentrated version of their own musk. It is quite difficult to get rid of it, not to mention the skunk’s scavenging activities on your property, causing similar problems as raccoons. But there is no need to escalate when it comes to skunks, as there are multiple measures you can take without getting skunked, and without harming the skunks as well. Skunks belong to the weasel family called Mustelidae, along with badgers, fishers, otters, ferrets, minks, ermine, pine marten and the most famous of them all – wolverines. If that name rings a bell, you would be right, as the resistance group in the cult-classic movie – Red Dawn – was named after wolverines, signifying the ferocious and tenacious nature of these lithe and powerful creatures. Although skunks share the same family with wolverines, they have taken a different evolutionary path and are actually quite mild-mannered. Their odorous defense and eating habits posing mere nuisance, instead of a real threat to humans and other animals, although if their spray gets into your eyes it can cause quite a discomfort, to say the least. Skunks are easily recognizable by their white stripe, stretching from head to tail. What Trouble Can Skunks Cause? Mother Nature is a cruel mistress, so like with all wild animals, skunks too are constantly being assailed by various diseases and pests. Which they can spread to you, your family or your pets. They can carry worms, parasites, fleas, and ticks, but most importantly they are very susceptible to rabies and leptospirosis. Therefore, any physical contact with a wild skunk should be avoided. Fortunately, they only act if frightened so always look to avoid the escalation of the encounter. In addition to nasty biological contamination, skunks may disrupt your garden as they dig holes in their perpetual hunt for insects – their favorite food – and if not satisfied, they will often scavenge your garbage cans and bags. Depending on what kind of home you have, they may even burrow under it, potentially damaging the infrastructure for electricity and water. And finally, they naturally leave their musky scent all over the place, which will be your first indication that you have skunk visitors. All that being said, skunks can also be beneficial as they eat insect pests from your garden, and even rodents. You will rarely find a situation when a skunk will intentionally bother people, like you can with raccoons. So, before deciding to shoo skunks away, consider if you want to in the first place. 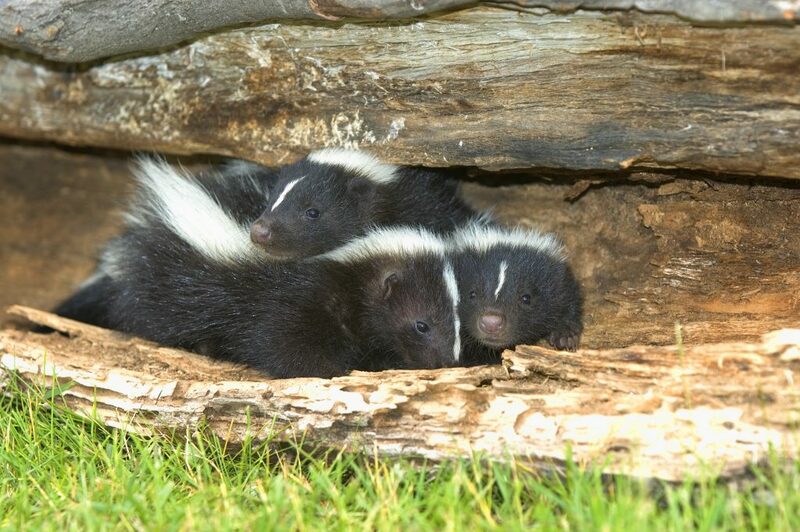 If you are not too bothered by the faint musky smell when you leave the house, you may take into consideration that skunks need shelter, especially during the cold winter months. They will only take a temporary refuge and move along when ready. Also, they are nocturnal so you will rarely see them, unless they have to take care of their young. As stated previously, skunks not afflicted with rabies are well-mannered and coy, and will deploy their last line of defense only when they or their young feel threatened, and if they see no easy way out of the situation. Twisting their rear end in your direction. If you see any of those signs, it is time to slowly and quietly retreat. If you happen to have other pets, like a dog or a cat, make sure they are properly restrained as they will not recognize these signs for what they are – a warning to clear the area. Leaving food outdoor for pets, including birdfeed. Leaving around convenient denning places like wood piles, open sheds, crawl spaces under porches and concrete slabs, etc. Eliminating easily accessible food and shelter is a sure way to avoid encounter with a whole host of wild animals, skunks included. Also, try to not over-water your garden/lawn as that will cause the grubs to near the surface, and the wet soil will be ideal for digging them out. How to “Persuade” Skunks to Leave? Although somewhat stubborn, skunks are not aggressive and if they see that there is more hassle in staying on your property than it is worth, they will leave of their own accord without having to employ any aggressive measures on your part. As nocturnal animals, skunks obviously do not care for bright lightning. Use this to your advantage so install a flood light with a motion detection feature, or use a manual flashlight to disturb their den from a safe distance. Use noise – place a portable speaker near the den and let it rip. The combination of both light and noise disturbance should do the trick, but you can up your chances even further by making a repellant which you spray around the denning area. You can either buy a repellent spray, or make it yourself by boiling onions, hot peppers, and cayenne pepper. After you have strained it, place the mix into a spray bottle and sprinkle at skunk level. You can even place a used kitty litter near the entrance to the den. Moth balls are another common trick to use. In short, you could develop a skunk problem if they have deemed that some area of your property is worthy for denning – dark enclosures that shelter from the weather. Make sure that this area no longer holds that appeal, preferably when the skunk is not in the near vicinity, and they will soon leave on their own without much hassle. When that happens, remember to employ the preventative measures as well, the most important of all – the sealing of possible den locations.